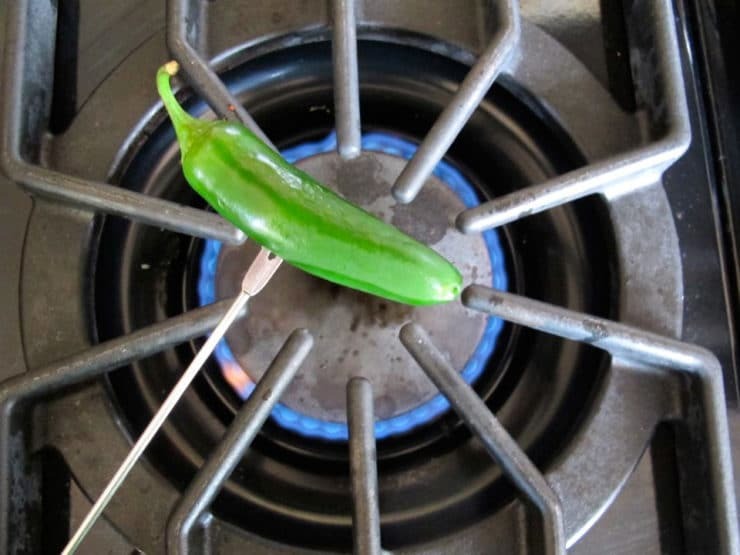 Ever wondered how to roast a jalapeño? If you’re like me, you love the flavor of jalapeño, but find its spiciness a bit overwhelming in certain dishes. 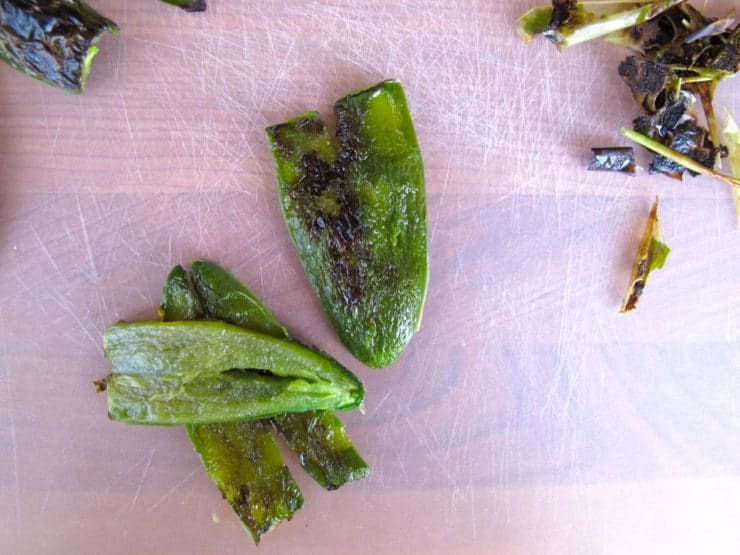 Roasting jalapeños mellows their spiciness a bit and gives them a nice, smoky flavor. It’s a pretty simple process. I’m providing two methods here– one for under the oven broiler, and one for on top of the gas stovetop or grill flame. These methods can actually be used for any kind of medium sized chili pepper (the ones that are around the same size as a jalapeño). Make sure you use gloves whenever you work with jalapeños, or you’re in for a world of hurt, especially if you have sensitive skin. Chilies contain capsaicin, a secondary metabolite produced by the chili that makes it spicy. The more capsaicin a pepper has, the spicier it is. Jalapeños have quite a bit of capsaicin, which can transfer to your skin and cause a burning sensation/irritation. Disposable gloves will protect you from the capsaicin. One more tip–never rub your eyes when you’re working with chilis– they will burn/sting for several minutes if you do! 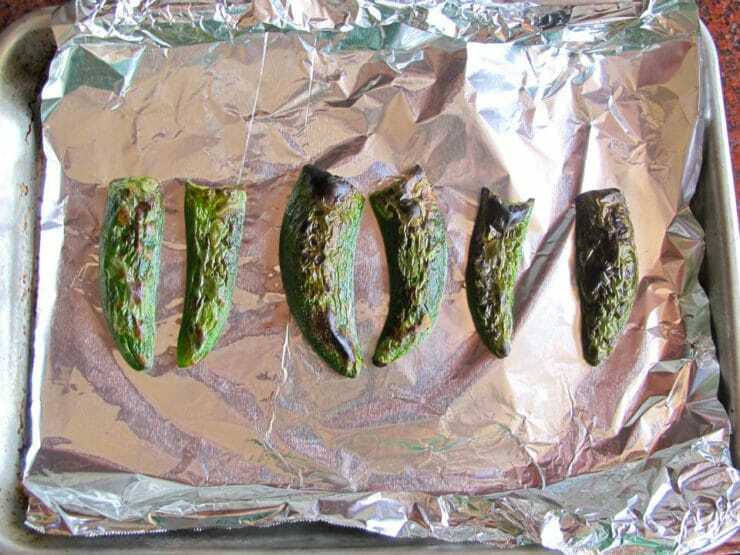 Learn how to roast jalapeños - oven roasted, under the broiler, or on a gas stovetop. Mellows the spice and adds a delicious smoky flavor. 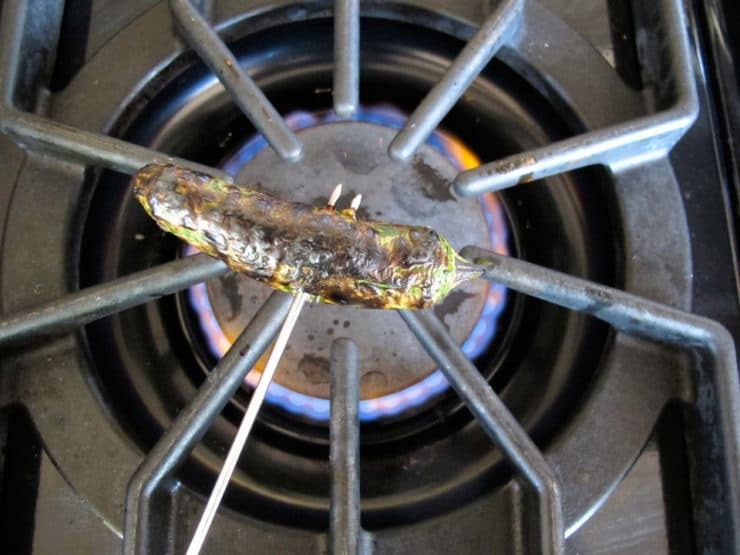 Turn your gas stove flame on medium, or light your grill. Roast peppers one at a time. Spear the pepper with a long skewer. Hold the pepper 1-2 inches over the open flame, being careful to keep your hands far from the heat source. Hold the pepper over the flame for 60-90 seconds until the skin on one side chars and blisters. It should be mostly black, with just a few areas of green. Do not let the pepper catch fire. Turn the pepper and let the other side roast for 60-90 seconds till evenly charred. After you roast the pepper, you will need to steam it. Steaming helps to loosen the skin and make peeling easier. I like to place the roasted pepper on a flat, smooth surface like a cutting board, then invert a large bowl over the top of it. The bowl traps the steam inside. Steam for 15 minutes. You can also place the pepper in a paper bag and seal. Repeat the roasting process for remaining peppers, adding each roasted pepper to the bag or under the bowl as you go. After the last roasted pepper is added, let the peppers team together for at least 10 minutes. After steaming, remove the stem and peel the charred skin from the peppers. Be sure to wear gloves; even after roasting, the capsaicin can still burn, especially if you have sensitive skin. Remove the seeds by slicing the pepper open and gently scraping the seeds out with your fingers. If you want your dish really spicy, you can keep the seeds in there... careful, they are very potent! Preheat your broiler. Make sure you put on your disposable gloves before you begin. Slice the stems from the jalapeños, then slice them horizontally in half. Scrape the seeds out of the jalapeños. If you want your dish really spicy, you can keep the seeds in there... careful, they are very potent! Line a small baking sheet with foil. Place the seeded jalapeños open side down, skin side up onto the baking sheet. Place the baking sheet in the oven, 3-4 inches from the broiler. Let the peppers roast for 3-4 minutes till they are charred and the skin is blistered. The skin should be mostly black, with just a few areas of green. Watch them closely and don't let them roast too long, or they will dry out and become difficult to peel. After steaming, peel the charred skin from the peppers. Be sure to wear gloves; even after roasting, the capsaicin can still burn, especially if you have sensitive skin. Note: Nutrition facts above are for 1 jalapeño. I cooked these in the oven on my pizza stone. They were excellent! Hi tory. I wanted my seeds in and roasted them in a covered cast iron pan for 10 minutes. When I removed the lid my kitchen was toxic and I had a coughing jag. Then my dog started sneezing and my partner ran upstairs. Hilarious! I love your ideas. Question: what is the taste difference between roasting the Jalapeño at high temp vs low temp? Hi Anthony, Tori’s assistant Ashley here. I have read some info online that claims roasting jalapenos over high heat causes them to be spicier, though I have not tested this myself to know for sure. You may wish to try using a hand cleaner like “GO-JO” or other with lanolin, If you encounter the infamous jalapeno juice. It’s been the mechanic’s best friend for years. It also works well removing many stains. Great post! Thanks for all the recipes, just wondering what would be the best way to store them after they’re roasted? To extend shelf life, I recommend freezing them. Lay them onto parchment-covered cookie sheets and freeze, then pop them off and drop them into freezer bags for storage. This is the safest and best way to keep them for longer periods of time. Enjoy! Thank you for this recipe. I wanted to try roasting jalapeños, but was daunted by the steaming part in other recipes. When I read about using a bowl, i thought I’d try it. I didn’t use a bowl, as I didn’t have one that would work. I grabbed a large rubber maid container and plopped it right over the pan I used to broil the peppers. After 10 minutes, I flipped it over and used it to put both the peppers and skin in. So easy! Thanks for the great idea to steam with a bowl using the peppers own moist heat. 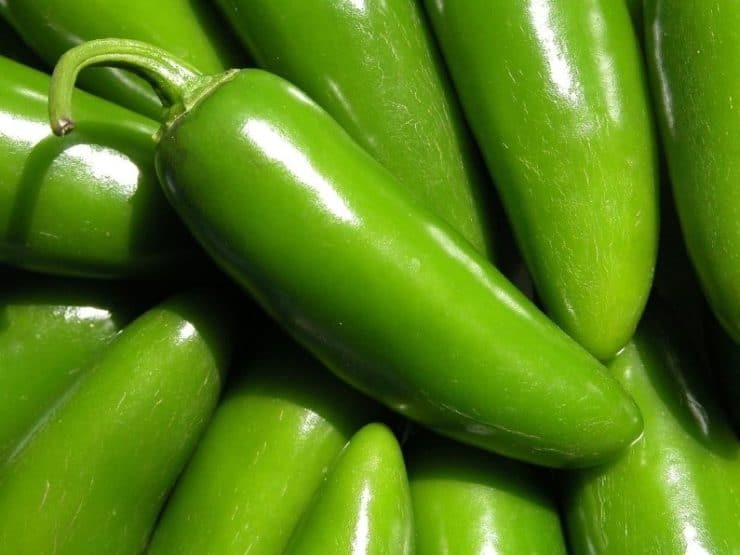 How can I roast jalapeno peppers when I don’t have a gas stove or a bbq grill? Take a heavy, preferably cast iron, frying pan. 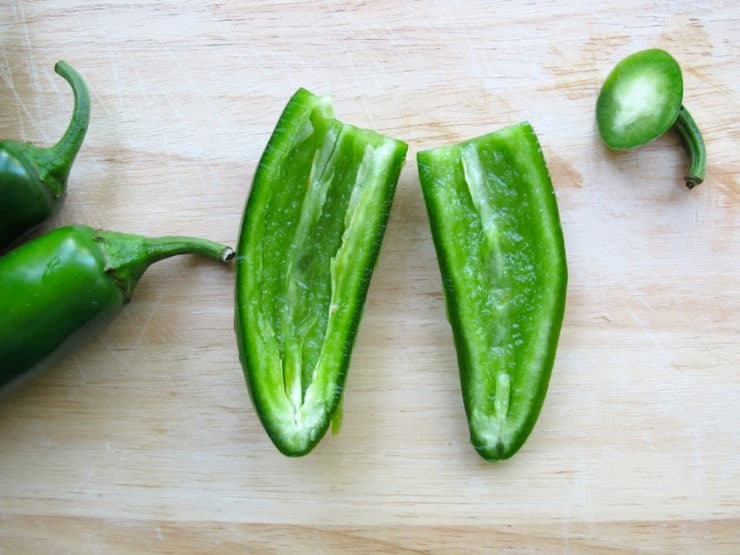 Cut the jalapeños in half or in quarters, removing pith and seed. No lay another, not quite so heavy, frying pan ON TOP of the jalapeños. By letting it lie there atop the peppers you are applying pressure, and the peppers will be sorta pressed into the hot surface of the cast iron pan. The skins will now toast evenly. Apply medium heat until pepper skins are blackened, and proceed as the main recipe here indicates. Alternately I use a round spatter guard directly on my electric burners (the kind with a handle that you use to put over your fry pan to keep oils and fat from spattering out. Just lay the guard directly on the burner. Turn on medium high and turn the peppers with some tongs until they are scorched. Smoked and dried jalapenos are called chipotles. Then cooked in a sauce, are called chipotle in adobo, often canned. Both commonly available. Roasting is not the same as smoking and drying. Most Mexican restaraunts will serve you roasted jalapenos if you ask. Can you freeze them after they’ve been roasted and treated this way? Does it matter if you leave the seeds on? Any suggestions? My daughter is lactose intolerant. What ideas of how to prepare roasted jalapenos (after skinning, which is too much time, by the way) without cream cheese and mayo contents? Love the option with the Cream Cheese from Sally – I WANT to try it NOW! I dont have an outside grilll… so will adjust. Thanks SO much… I so LOVE jalapenos! Happy you liked them Phyllis! I really love the smoky flavor roasting imparts. Great tutorial Tori. The addition of the gloves will save me a trip to the hospital next time I do mine. I love roasting peppers. It’s just so much fun. And the taste is just out this world. Thanks for showing me the right way to do it. One big reason to always wear gloves when handling hot peppers is if you wear contact lenses; the oil from the hot peppers is really hard to totally remove from your fingers. I remember learning this lesson many years ago and haven’t forgotten it! I wonder if I could put the peppers in a glass dish with a glass lid. I’m not real excited about putting hot food in plastic. You can use a paper sandwich bag instead! Hi Mary, since writing this post I’ve found a new favorite method for steaming. I place the hot peppers on a smooth surface and invert a bowl (usually a glass one) over the peppers. This captures the steam inside. 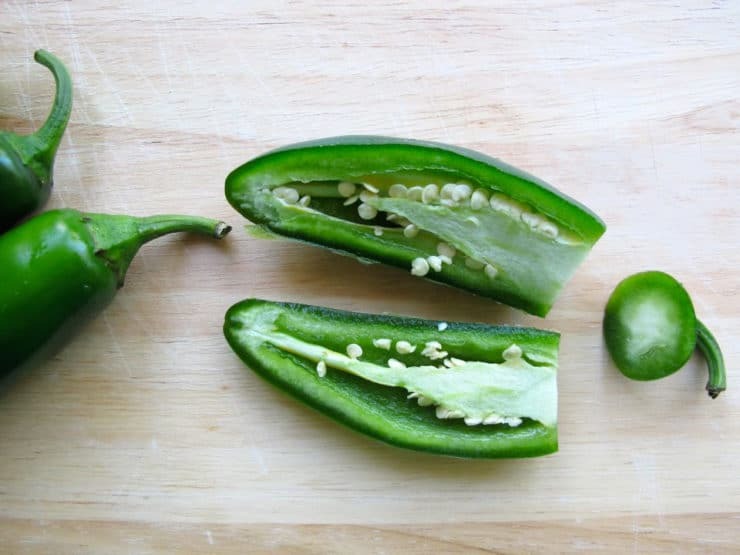 Use a smaller bowl for jalapenos, since they’re a small pepper. Paper bags work great too, as Niall suggested. I’ve modified the instructions in the post. If you DO get jalapeño stuff on your bare hands, it is hard to remove because some of it is an oil. Rub your hands well with Vaseline Intensive Care Lotion, or similar product, and THEN wash with soap and water. The fats in the Lotion will help remove volatile oils the jalapeños left on your hands. Ditto on the jalapenos and contact lens. My eyes hurt so bad i couldn’t even open them long enough to take them out and then when I did I got the Jalapeno spice on the lens and we went to ER for that dumb trick. I do the same with red, yellow and orange bell peppers…except I just pop them on a grill and stick them in a bowl with plastic wrap on top. Peel, cut up and serve with some good quality olive oil and sea salt….delicious! 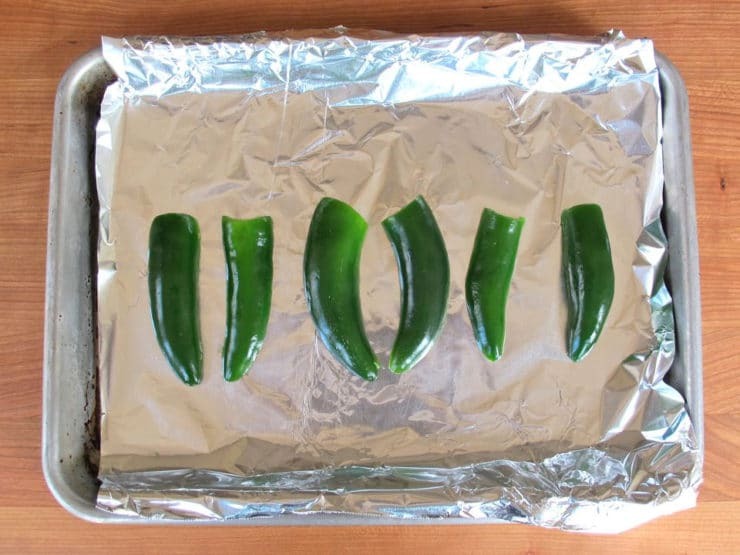 …..but I’ve never thought to roast jalapenos – genius! Have you tried blackening them in a cast iron skillet on top of the stove? Works great. Instructions for grilling in cast iron skillet please. Do you remove the skins after roasting the stuffed jalapeños or serve as is with skins on? One of my favorite appetizers is roasted jalapenos stuffed with cream cheese and prosciutto. It is delicious! Cut the tops off peppers, use a potato peeler to scrape out seeds and membranes, stuff with a mixture of cream cheese and prosciutto and roast on an outdoor grill until skin blackens. They are so popular in the southwest (I live in New Mexico) that the local farmer’s market sells a ‘jalapeno roaster’ that holds a dozen jalapenos for grilling upright. Plain cream cheese is good in them too! Great instructions! I prefer the outdoor gas grill…less mess. I fire roast Chiles Poblanos for Chiles Rellenos and tomatillos for Salsa Verde this way. I just use long tongs to turn them. Can’t wait to see what you do with those jalapenos! sounds good… i take jalapenos and an onion ,mince them fine and mix them with ground turkey ..shape into patties..dust with flour on both sides.. fry till done.. delicious !